Mmmmm, Boboli. ← You Want Me To Wear What? Ignoramus that I am, when I read “Boboli,” I immediately became hungry, as my first thought was that pizza stuff you can buy at the market. I didn’t realize it was actually the name of a garden. So, thank you ModCloth, for giving me some culture. 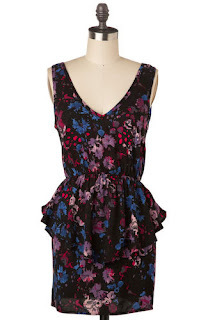 I’m still not buying this dress, though, because it has a massive peplum and a cheap elasticized waist. It looks like they stole the waistband from a pair of sweats. Which, yes, comfortable, but if I’m going to wear a comfortable dress, I want it to mask my flaws, rather than draw attention to them with giant hip ruffles.